The newest amaro your at-home bar cart needs is not an import. 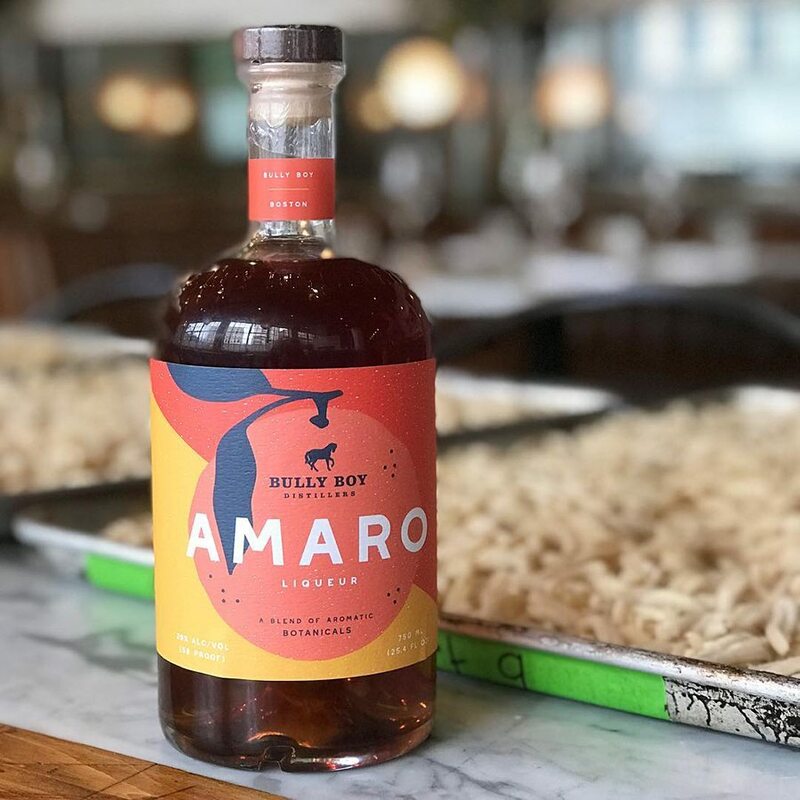 While it’s inspired by the traditional, bitter liqueurs from Italy, and it features a globally inspired flavor profile heavy on citrus and hops, Bully Boy Amaro is uniquely Boston—if only because it was created here over the course of dozens of test batches. The newest addition to Bully Boy Distillers’ year-round lineup of Roxbury-made spirits is a balanced booze in a beautiful bottle, and it hits the market around New England next week. “Amaro” translates to “bitter,” but it also describes a number of unique liqueurs, each comprised of its own blend of herbs, roots, and flowers steeped in a neutral spirit; Cynar, Fernet, and Amaro Montenegro are some of the best-known Italian amari. Amaro is traditionally sipped as an after-dinner digestif, but it’s gaining traction as a cocktail ingredient. Amaro has always been a part of Bully Boy’s business plan, says cofounder and head distiller Dave Willis. But he’s only been able to start experimenting with that style of liqueur in the past year-plus, after he and his brother, Will, expanded their company into a larger production facility with an awesome little cocktail bar. “I can try something out [with the recipe], and even if it doesn’t work it can be used in cocktails. I’ve been able to do these different iterations for the last year and it’s allowed me to hone the recipe down,” he says. Bully Boy Amaro begins with a blend of a neutral grain spirit and a clean rum as a base. Then, instead of looking at the New England terroir to inspire his bitter-sweet flavor profile, Willis considered his two favorite amari—Montenegro, and Mondino from the Bavarian Alps. The rest of the flavor profile—more than 20 additional herbs—is built around the fruit backbone. “I was willing to go to the corners of the earth to find botanicals that would work well with each other,” Willis says. So there is Szechuan peppercorn, California coriander, fig, yarrow, Turkish rhubarb root, and more. Galaxy, Citra, Amarillo, and Cascade hops from Washington State—four of the most common American-grown bittering agents in craft beer—are Willis’s way of nodding to the American drinks industry. “Hops are a big part of what’s going on with the American beverage scene, and I need to infuse some bitterness into amaro. They give an underlying flavor and aroma, and they also have some utility,” he says. Amari also tend to differ in strength, ranging from about 20 to 70 proof. Bully Boy Amaro clocks in at 58 proof, which Willis says gives it “enough backbone that you can use it in cocktails, but at the same time it’s soft enough that you can sip on it’s own.” He suggests sipping it neat. “You really get the bitterness, the sweetness, and you can really pick out the different aromatics. It’s a great way to really get an appreciation for it,” he says. But he’s also into the simple Boston Buck cocktail that bar manager Rich Andreoli created at Pammy’s created for the Bully Boy Amaro debut: Just the liqueur with lemon juice and tonic, shaken and strained into a collins glass. “The tonic really made all the floral and citrus notes pop,” Willis says. Pammy’s—which is owned by the Bully Boy owners’ brother, Chris, and his wife, Pammy—was the first place to pour Bully Boy Amaro. Along with the Boston Buck, the Cambridge restaurant is also featuring it in a new drink called Alitalia, shaken with a private cask Bully Boy Bourbon, Aperol, lemon, and Angostura bitters. Launch week events continue tonight at Coppa, Thursday at Urban Grape, and Friday at the Bully Boy cocktail bar. Look for Bully Boy Amaro wherever the company’s products are sold beginning the week of October 22.